Is it Time for Furnace Repairs? When it comes to the temperature inside our homes, many of us tend to just ‘set it and forget it.’ Well, today we are here to tell you that setting an appropriate indoor temperature is super important for efficiency, and efficiency really does matter. One way that we can boost efficiency in our homes is by changing the way in which we interact with our HVAC systems. Being that we still have a long winter ahead of us here in Connecticut, now is a great time to start! Simply by upgrading your thermostat, you can boost efficiency and save money this winter. 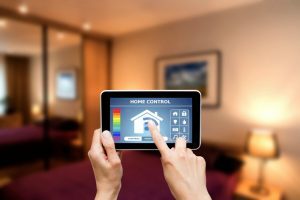 Unlike a traditional thermostat, smart thermostats grant homeowners ultimate control over their heating (and cooling) systems. An efficient system means less money spent on energy bills and Norwalk, CT heater maintenance. If you aren’t yet convinced, you’re in luck. Today, we have outlined some of the many reasons why you should consider making the switch to a smart thermostat today. Keep reading below to learn more. A manual thermostat is any thermostat that you set manually using a dial or a switch. The trouble with these types of thermostats is that they are highly inaccurate, as many homeowners have trouble seeing those tiny, little marks that represent a certain temperature. This issue often leads to frustration, as the temperature you feel doesn’t align with the temperature you think you’ve set. So, you end up going back to the thermostat dozens of times throughout the day to make minor adjustments. Although this does not seem like a big deal, it can really take a toll on your heating system, leading to increased wear and tear and lower efficiency. Smart thermostats with a digital display make it so that there will never be any questions about whether or not the temperature you see on the thermostats is correct. Old, outdated thermostats often lack the programming you need to make your home efficient. Far too often, homeowners set a comfortable temperature and forget to lower it before heading out to work or going to sleep at night. Although this might not seem like a big deal, it can cause your monthly heating bills to skyrocket. A smart thermostat makes it so that you’ll never have to worry about forgetting to adjust the temperature before leaving your home or going to bed. With a smart thermostat, you can create a heating program based around your personal schedule. Plus, some smart thermostats are capable of learning your habits to create an even more advanced, and highly specific, program for you. A smart thermostat with WiFi capabilities allows you to connect to your HVAC systems from anywhere in the world. So long as you own a smartphone, tablet, or computer, you can adjust the temperature of your home, even from the other side of the globe! Some smart thermostats are capable of analyzing local weather conditions to make adjustments to your indoor environment. Others are even capable of highlighting opportunities for you to save even more money! To learn more about smart thermostats, contact Celco Heating & Air Conditioning. © 2013–2019 Celco Heating and Air Conditioning. All rights reserved.